Antonio Ramón Jiménez Ruiz was born in Santander, Spain, in 1968. He received the degree in physics and computer science and the Ph.D. degree in physics from the Universidad Complutense de Madrid, Spain, in 1991 and 1998, respectively. Since 1993 he has been within the Centro de Automática y Robótica (CAR) that belongs to CSIC (Spanish Council for Scientific Research), Madrid, Spain, where he holds a research position. 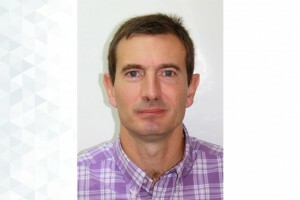 His research expertise is in the areas of local positioning solutions for indoor /GPS-denied localization and navigation of persons and robots, signal processing, Bayesian estimation and inertial-ultrasonic-RFID sensor fusion. He has published more than 100 articles in journals and conference proceedings, and he is reviewer of many international journals and projects in the field. Off-Line Evaluation of Mobile-Centric Indoor Positioning Systems: The Experiences from the 2017 IPIN Competition. Smartphone-Based Cooperative Indoor Localization with RFID Technology. Comparing the performance of indoor localization systems through the EvAAL framework. Comparing Ubisense, BeSpoon, and DecaWave UWB Location Systems: Indoor Performance Analysis. IEEE Transactions on Instrumentation and Measurement. Vol.66. Number. 8. Pages: 2106 - 2117. The Smartphone-Based Offline Indoor Location Competition at IPIN 2016: Analysis and Future Work. Improving inertial Pedestrian Dead-Reckoning by detecting unmodified switched-on lamps in buildings. Sensors. Vol.14. Number. 1. Pages: 731 - 769. Pedestrian navigation fusing inertial and RSS/TOF measurements with adaptive movement/measurement models: Experimental evaluation and theoretical limits. Sensors and Actuators, A: Physical. Vol.203. Pages: 249 - 260. Accurate pedestrian indoor navigation by tightly coupling foot-mounted IMU and RFID measurements. IEEE Transactions on Instrumentation and Measurement. Vol.61. Number. 1. Pages: 178 - 189. Auto-localization algorithm for local positioning systems. Ad Hoc Networks. Vol.10. Number. 6. Pages: 1090 - 1100. Error estimation for the linearized auto-localization algorithm. Sensors. Vol.12. Number. 3. Pages: 2561 - 2581. Improved heuristic drift elimination with magnetically-aided dominant directions (MiHDE) for pedestrian navigation in complex buildings. Journal of Location Based Services. Vol.6. Number. 3. Pages: 186 - 210. PDR with a foot-mounted IMU and ramp detection. Sensors. Vol.11. Pages: 9393 - 9410. A computerized system to determine the provenance of finds in archaeological sites using acoustic signals. Journal of Archaeological Science. Vol.36. Pages: 2415 - 2426. A short-range ship navigation system based on ladar imaging and target tracking for improved safety and efficiency. IEEE Transactions on Intelligent Transportation Systems. Vol.10. Pages: 186 - 197. Diversified local search for the optimal layout of beacons in an indoor positioning system. IIE Transactions (Institute of Industrial Engineers). Vol.41. Pages: 247 - 259. Improving the accuracy of magnetostrictive linear position sensors. IEEE Transactions on Instrumentation and Measurement. Vol.58. Pages: 722 - 729. RoPEUS: A new robust algorithm for static positioning in ultrasonic systems. Sensors. Vol.9. Pages: 4211 - 4229. Broadband EMFi-based transducers for ultrasonic air applications. IEEE Transactions on Ultrasonics, Ferroelectrics, and Frequency Control. Vol.55. Pages: 919 - 929. Advanced sensorial system for an acoustic LPS. Microprocessors and Microsystems. Vol.31. Pages: 393 - 401. Modal analysis of the piezoelectric generation of ultrasonic guided waves for nondestructive testing of cylindrical structures. Russian Journal of Nondestructive Testing. Vol.43. Pages: 683 - 691. AIR COUPLED ULTRASONIC DETECTION OF SURFACE DEFECT IN FOOD CANS. Measurement Science and Technology. Vol.17. Pages: 1409 - 1416. A robotic vehicle for disabled children. Providing assisted mobility with the PALMA project..
IEEE Engineering in Medicine and Biology Magazine. Vol.24. Pages: 55 - 63. A robotic vehicle for disabled children. Estimating the 3D-position from time delay data of US-waves: Experimental analysis and a new processing algorithm. Sensors and Actuators, A: Physical. Vol.101. Pages: 311 - 321. New adaptive filter and quality evaluation index for image restoration. Pattern Recognition. Vol.34. Pages: 457 - 467. A survey of computer vision methods for locating fruit on trees. Transactions - American Society of Agricultural Engineers: General Edition. Vol.43. Pages: 1911 - 1920. A vision system based on a laser range-finder applied to robotic fruit harvesting. Machine Vision and Applications. Vol.11. Pages: 321 - 329. Automatic fruit recognition: A survey and new results using range/attenuation images. Pattern Recognition. Vol.32. Pages: 1719 - 1736. Design and implementation of an aided fruit-harvesting robot (Agribot). Industrial Robot. Vol.25. Pages: 337 - 346. Quasi-exact linear spring countergravity system for roboticmanipulators. Mechanism and Machine Theory. Vol.33. Pages: 59 - 70. Featureless classification of tactile contacts in a gripper using neural networks. Sensors and Actuators, A: Physical. Vol.62. Pages: 488 - 491. Nonlinear Performance Index (npi): A Tool for Manipulator Dynamics Improvement. Journal of Intelligent and Robotic Systems: Theory and Applications. Vol.18. Pages: 277 - 287. Sistema de reconocimiento y localización de objetos cuasi-esféricos por telemetría láser. Aplicación a la detección automática de frutos para el robot Agribot. Localización de personas mediante sensores inerciales y su fusión con otras tecnologías.